The name Maccabees means the hammer and as we read through these books in scripture we experience a great deal of violence in the name of God. These books are stories about “the attempted suppression of Judaism in Palestine in the second century B.C. . . . [The author’s] purpose in writing is to record the salvation of Israel which God worked through the family of Matthias . . . Implicitly the writer compares their virtues and their exploits with those of the ancient heroes, the Judges, Samuel, and David”. (Senior 550) Portions of this book may be used when dedicating an altar . . . or when praying for persecuted Christians. The lesson here is that living the life of an apostle of Christ will inevitably include bloodshed – whether it be spiritual, mental or physical. Each time I pray to my Mother for a special intercession, I find myself in this story. She, the gentlest of shepherds, realized real battles in her life. Her slogan was: Kill them with kindness. There is no avoiding the central message of Jesus’ life: When in doubt, exercise kindness and compassion . . . and listen for the word of God to tell us which way to turn, when to pause, when to proceed. Tomorrow is the Feast Day of St. Gertrude. My mother and my sister – both deceased – are named for this saint. Both of these women had a plodding, patient persistence when confronted with evil, and they were formidable and unmoved when it came to right and wrong. The Morning Prayer for tomorrow begins with a verse from Isaiah (30:15): By waiting and by calm you shall be saved, in quiet and in trust your strength lies. I reflect on the betrayal and carnage we witness when we read Maccabees. The deception of the son of Abubus who gives the faithful a deceitful welcome shakes me to the core. There is nothing more wicked than luring in the innocent to later spring up, weapons in hand, to rush upon the loyal servant of God – thus repaying good with evil. What do we do when we are witness to this? We are utterly astounded as is John in today’s reading. We go to God who tells us to shake the dust of the unfaithful from our feet and move on. And we do as my mother always recommended: Kill them with kindness. Gertrude the Great was a German Benedictine mystic with a special dedication to the Sacred Heart of Jesus. A number of her writings are still in publication today. Gertrude of Nivelles founded an abbey with her mother, Itta, in present day Belgium. She is the patron saint of gardens and cats. Senior, Donald, ed. THE CATHOLIC STUDY BIBLE. New York, Oxford University Press, 1990.550. Print. Cameron, Peter John. “Prayer for the Morning.” MAGNIFICAT. 16.11 (2009). Print. A Favorite from November 12, 2009. Yesterday we reflected on the value of seeking wisdom in times of trial. Today we focus on seeking justice in times of injustice and these three psalms serve as a kind of trilogy of prayer. I am struck by the titles of these songs in English first and then in Spanish. We are lead from naming injustice, through seeking God in order that we see what is good about our situation, to arrive at the result of God’s way of being. In God’s world, the wicked suffer consequences for their descent into darkness and secrecy while the faithful are rewarded for their perseverance and patience. When we feel pummeled by life we might want to turn to these three prayers and give them our full focus. Rescue me from these ravening beasts; preserve my precious life from these lions. If we can identify the wicked ways of others then we know when and where to step cautiously. Do not allow my treacherous enemies to gloat over me; do not permit those who hate me without reason to wink their eyes at me. Humans fear that the darkness will encompass them; yet we have been promised the light. Sin speaks to the wicked one in the heart; . . . there is no fear of God. He deludes himself with the idea that his guilt will not be discovered and hated. In the end, nothing remains hidden. Those who engage in darkness forget that the light will reveal all. Oh Lord, your kindness extends to the heavens; your faithfulness to the skies . . . With you is the fountain of life, and by your light we see light. We must appeal to God to show us how to find strength through our kindness. Do not fume because of evildoers or envy those who do wrong. They will wither quickly like the grass and fade away like the green herb. Put your trust in the Lord and do good . . . Sinking to the level of the wicked only makes the darkness more intense and brings it closer. In a short while, the wicked will be no more; no matter how diligently you search, you will not be able to find him. We must not allow our anxieties and preoccupations to close in on us. Seek God in order to find stillness and quiet. But the meek will inherit the land and enjoy an abundance of peace. We must be meek as Jesus is meek, humble as The Lamb is humble. Two words struck me from today’s closing prayer at Mass which I will carry with me for awhile: Courage and Peace. If we have these two, we have all. This Psalm Trilogy today is a roadmap for our exodus out of fear and our arrival at promised serenity. We must have Courage in our God, for this is where we find a small pocket or a tiny island of tranquility . . . even amidst the trials and darkness that we suffer because of the wicked. When we find ourselves in pain at the hand of evil, we must take courage and seek justice . . . in order to arrive at peace. There are days when we need to hear words of encouragement. Today Paul fills that need. Every time we think of you, we thank God for you. Day and night you’re in our prayers as we call to mind your work of faith, your labor of love, and your patience of hope in following our Master, Jesus Christ, before God our Father. There are nights when we need an affirming hug, a kiss of peace. This noontime we anticipate this affirmation of love. It is clear to us, friends, that God not only loves you very much but also has put God’s hand on you for something special. There are hours and minutes when we have taken on more than we can carry. This evening we take strength from the words of Paul. When the Message we preached came to you, it wasn’t just words. Something happened in you. The Holy Spirit put steel in your convictions. There are places and people challenging us beyond our limits. Now we rely on Paul’s urging to follow Christ. There are obstacles we cannot overcome, ruptures we cannot heal. Now we trust that the Spirit will restore and transform. The news of your faith in God is out. We don’t even have to say anything anymore—you’re the message! People come up and tell us how you received us with open arms, how you deserted the dead idols of your old life so you could embrace and serve God, the true God. They marvel at how expectantly you await the arrival of God’s Son, whom God raised from the dead—Jesus, who rescued us from certain doom. There are moments when we do not know how we move forward, and yet . . . we rely on our convictions of steel that we are loved by the Living God. When we read varying versions of these verses, we discover the gift of God’s presence, and our own convictions of steel. I didn’t try to impress you with polished speeches and the latest philosophy. I deliberately kept it plain and simple: first Jesus and who he is; then Jesus and what he did—Jesus crucified. In our present world we might well hesitate to speak or act for fear of abandonment or retribution. Paul and Isaiah give us words we need to hear. God says: If you do not speak up for my little ones because you worry about finding the words for a polished speech, you go astray. When you live in me, my Holy Spirit will give you the words you will need. If you do not act in defense of the marginalized because you fear you do not have enough courage, you wander far from The Way. When you live in Christ, my Son will give you the strength and persistence to act as you know you must act. Rest in my Spirit and you are never without resource. Abide in Christ and you are never alone. Remain in me and you will never be without all that you need to see you through this day. When we compare various translations of these verses, we find the strength to persevere in the face of obstacles, and graceful words for our simple but polished speeches. Jesus proposes that we forego power and wealth, pleasure and honor. Today we consider the quality of meekness that Jesus so willingly exhibits as he walks among us. This vision of the world sees gentleness as a quality of those who are close to God. This picture of the world sees kindness as an essential trait of those who live by God’s design. This view of the world sees humility as crucial to the living of God’s plan. This picture of the world sees physical possessions as stumbling blocks to intimacy with God. The Gospels show us how God’s Word teaches us that meekness as authentic strength. They show us that Jesus returns anger with kindness, and responds to provocation with piercing questions. They show us that the Spirit nurtures sacrifice rather than acquisition. How do we find strength in our meekness, and courage in our kindness? 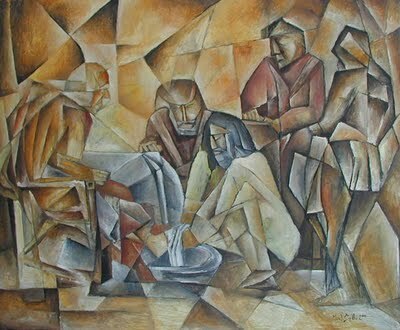 How willing are we to wash the tired feet of others? When we compare varying versions of this verse, we better understand how humility provides us with far more peace than our possessions do. For more reflections on meekness as enacted by Jesus, enter the word in to the blog search bar and explore.